IsaDora is a Swedish beauty brand that covers everything from nail polish to face makeup to perfume to skincare to brushes! The lovely Ulrika from IsaDora sent me over some polishes from their Sugar Crush collection, a matte, glittery texture formula. IsaDora has a huge span of fifteen texture polishes in every color imaginable. They are an animal cruelty free brand and free from formaldehyde, camphor, toluene and dibutyl phthalate (DBP). These bottles are smaller than most polishes in the US. They are 6ml or .2 Fl oz. I know, I know you're eager to get to the swatches! Turquoise Crush (110) Turquoise crush is a light blue base with small silver glitters and larger silver glitters that spread studded throughout. The coverage was perfect and I only needed a few coats. The brushes in these polishes are wide and I could cover each of my nails in about two strokes, one on my pinky. 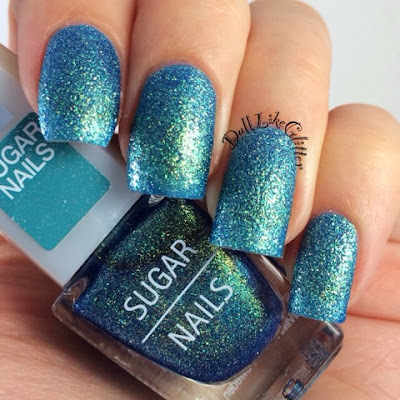 Like most texture polishes these dried quickly with a matte finish that gives a unique look to the glitter. 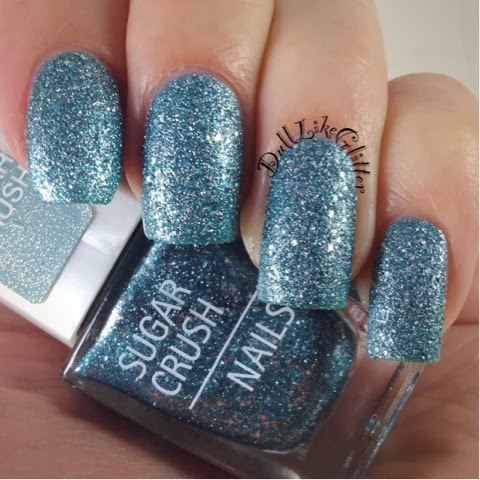 Diamond Crush (100) This Sugar Crush polish was very similar to Turquoise Crush. This silver base is all small glitters and large silver glitters give a little change up to the formula. This turned out to be more sheer than the others needing three coats. My nail line is still slightly visible. Emerald Crush (112) This vampy polish consists of a deep base with small blue glitters. The blue glitters catch a purple hue in low lighting that is really gorgeous. The dark crush colors have great payoff and are full coverage in one or two coats! This color is one of my favorites from the six I was sent! Ocean Crush (128) Limited Edition I DREAM in this color. If someone described my aura, it would be this color. I want to eat this color. The damage to my internal organs would be totally worth it. Ocean Crush is an ocean blue full of yellowish-green opalescent flecks. The dimension in this polish will blow you away. There are deep blues that lighten with highlights and the green shimmer shows up only at the brightest spots. The texture catching the light on multiple facets makes this color complex and utterly crash-your-car-because-you-can't-stop-looking-at-your-nails worthy. Unfortunately this color is limited edition. The only solution is to buy twelve bottles so you're set for life. Black Crush (118) This color turned out to be one of my least favorites. The formula was there and I only needed one or two coats but the dimension that the other shades have compared to this is just lackluster. The black base absorbs light while the small silver pieces reflect giving a patchy look. It could be my personal color palette preference though so, if you're into it, definitely look into getting this shade. Wine Crush (108) Hello Autumn! This shade is made for this season. A deep plum base holds gold and purple/fuchsia glitters. Playing off each other they create orange and red hues. It's a fall wonderland! There is a lot of depth in the colors here that makes this a complex and beautiful shade. Added bonus, one or two coats was all I needed. Now for the bad news. IsaDora products are really only available in Sweden and other surrounding European countries. I have contacted independent polish carries such as Ninja Polish, Color4Nails and Llarowe to ask that they bring IsaDora to the states and distribute it here! If you are lucky enough to have a European nail mail buddy they may be able to send you some. If you want to get your hands on some of these beauties you can contact them and let them know we'd like some IsaDora here in the states and Canada. With enough requests I think we can bring IsaDora to this side of the world. Let's make a polish movement! Click here, here and here to request! If you are a lucky European duck you probably know all about IsaDora. 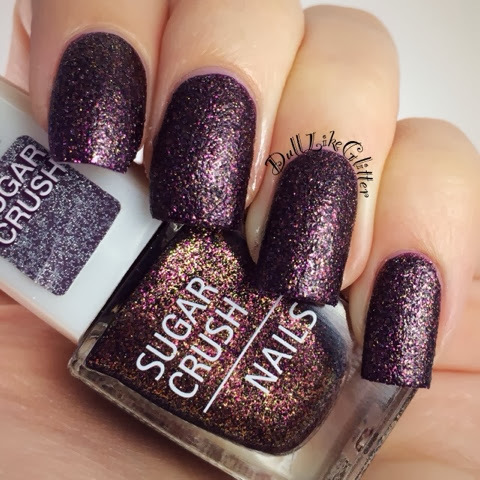 For you lovelies I suggest picking up your favorite Sugar Crush shades. My faves were Ocean Crush, Emerald Crush and Wine Crush. Diamond Crush and Turquoise Crush were also great, the formulas were just a touch thinner than the others. The only shade I wasn't feeling was Black Crush because of the flatness of the color. What you do you think of these IsaDora shades? I love your description of Ocean Crush and I totally feel the same way. That color is completely gorgeous and I'm obsessed! and yeah, Ocean is awesome! Congrats on 100K page views! I love textured polishes, they are so sassy! My email is candicecroix@gmail.com. Thanks so much for a great giveaway. Aaaaaand I just realized it ended a couple hours ago. Whoops. Christmas makes my brain turn to mush. Hope you had a great holiday!